About 30 miles East of Roseburg, Oregon on Highway 138 you come across an almost perfect spot to stop for a day or two on your travels. 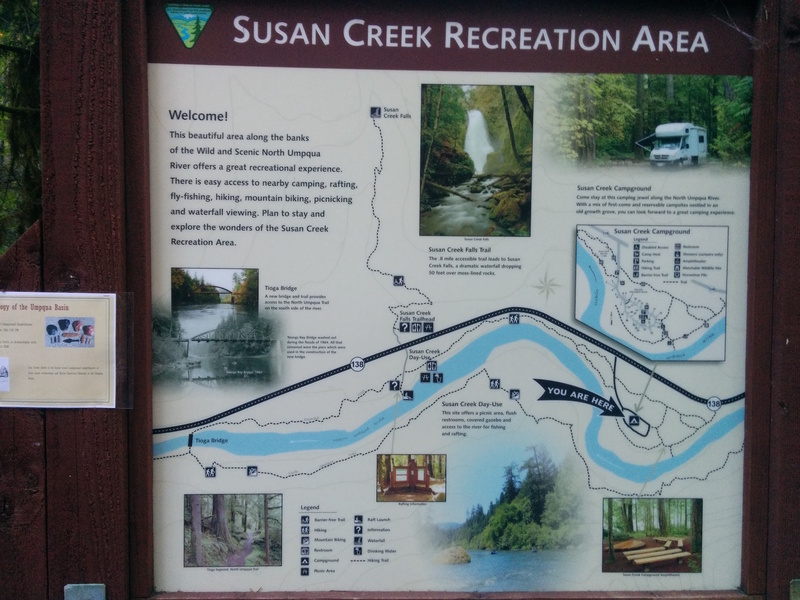 Nestled in a crook of the North Umqua River the Susan Creek Campground sits under a mature forest grove close enough to the river that you can hear it burbling on its way West. On those rare occasions when we actually spend money to camp instead of our usual habit of dispersed camping in forests there are several features we look for; showers, water and trash receptacles. Run by the BLM this campground is clean and offers all those extras we were looking for and, as an extra added bonus, as a federal agency they accept our Access Pass and we get half off the normal $20 a night rate. Once we found our spot and set up camp it was late enough that we decided to just crash there for the day and do some exploring the next morning. Showers were right across the roadway and I took a luxurious, hot shower which is light years better than my usual solar shower bag which, the best I can say about it is it kinda, sorta works. Now clean and smelling better than Willow (to humans) I changed the sheets in my camper shell so as not to recontaminate myself. After a relatively short walk around the campground and down to the river we came back, had a quick dinner and slept like the dead in order to recharge ourselves for whatever the next day would bring. The next day, after our traditional morning coffee ritual we decided to check out the hike to Susan Creek Falls whose picture on the information sign in the campground looked enticing. The little day use parking lot at the trail head to the falls is all of a 1/4 mile back West on the other side of Hwy 138 and so we could drive there in a whopping minute. 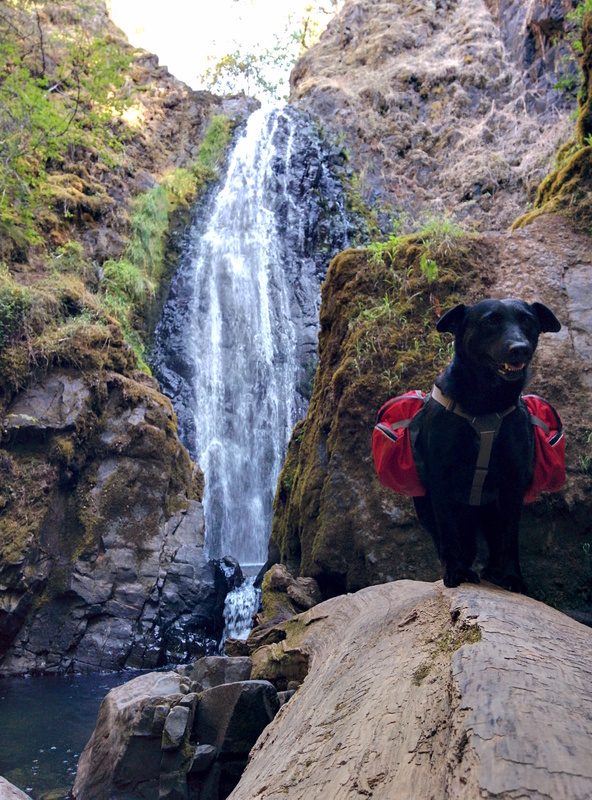 Once Willow was outfitted in her doggie backpack we set off on the .8 mile trail. 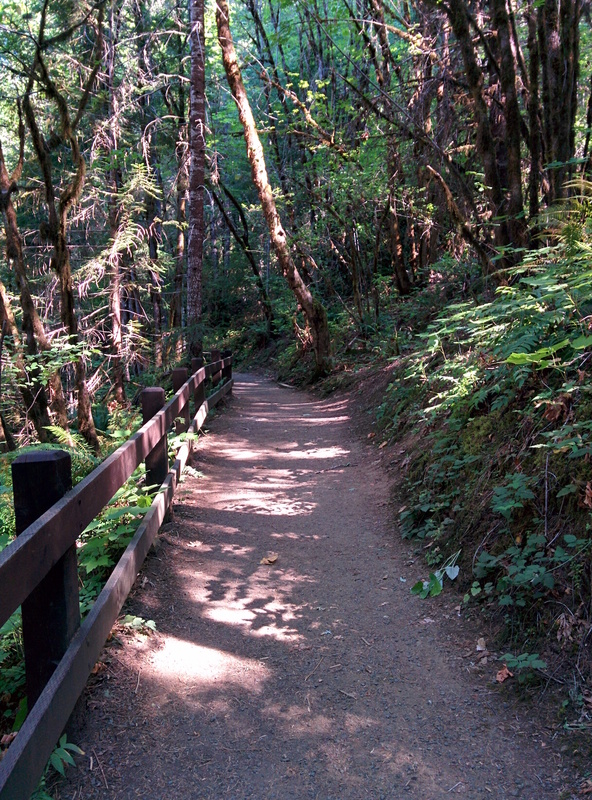 The trail was nicely maintained and gently sloped enough that we expect it is accessible to most wheelchair users. To us this and the short distance made it a “walk” instead of a “hike” which is fine by us. As a bonus we arrived early enough that no one else was on the trail either way so I broke the rules and let Willow off her leash so she could sniff and scout the way ahead. Soon enough we could hear the falls up ahead and our pace quickened. 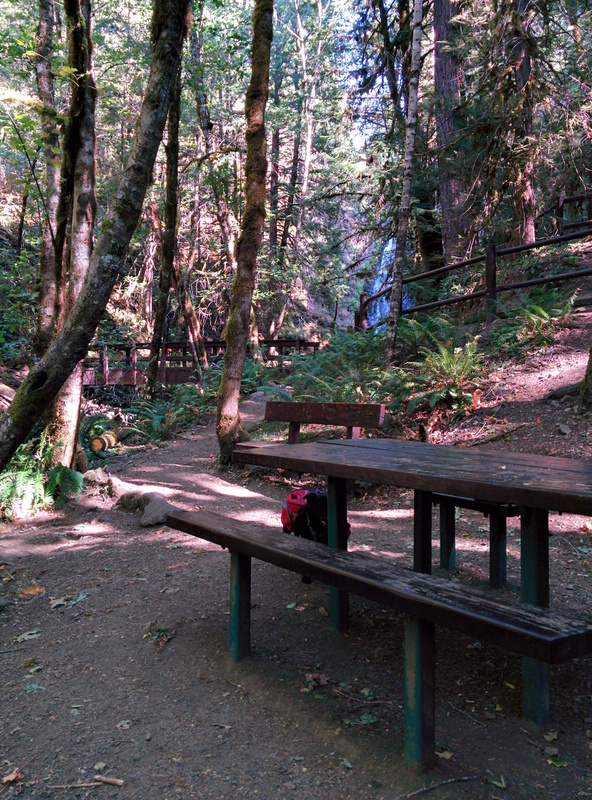 Around the last corner we spotted a small picnic area with a great view of the falls all of 100 feet away. 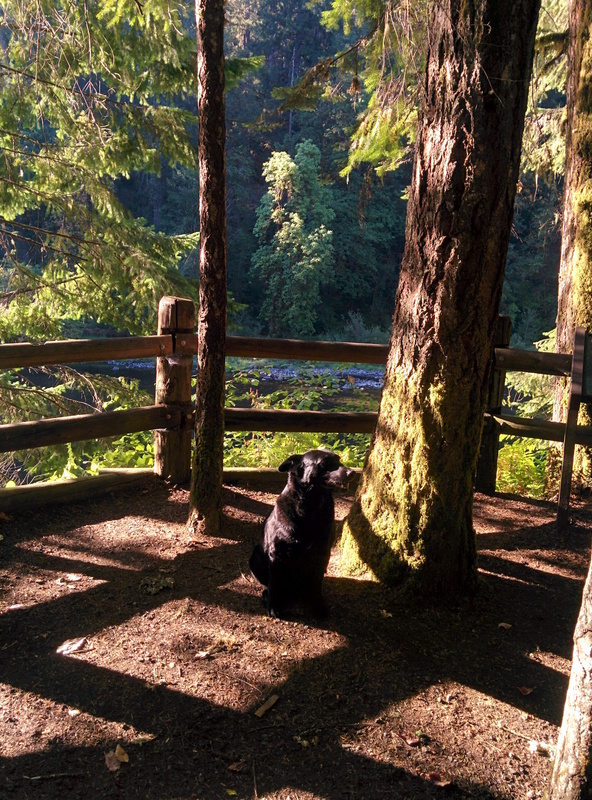 We walked the remaining dozen yards or so to the actual pool at the foot of the falls and I nicely asked Willow to hop up on a downed log for a few pictures. After taking far too many pictures of my gorgeous girl in this gorgeous place we turned back and took a quick break and sat down in the picnic area. Right about then is when we began to notice the sad overabundance of cigarette butts littered all over the picnic area as well as lots of other small pieces of cast off garbage. This was one of those rare occasions when we didn’t bring a plastic bag with us to pick up any found garbage but, as the luck of the slovenly would have it, we found a Safeway plastic bag stuck in some bushes and picked it up to use as our receptacle. We picked up all that we could right at the picnic area which included a matched set of flip-flops!?! On our way back down to the parking area we went slow and picked up numerous little pieces of garbage which consisted mostly of cigarette butts but also candy wrappers and fast food drink cups etc. 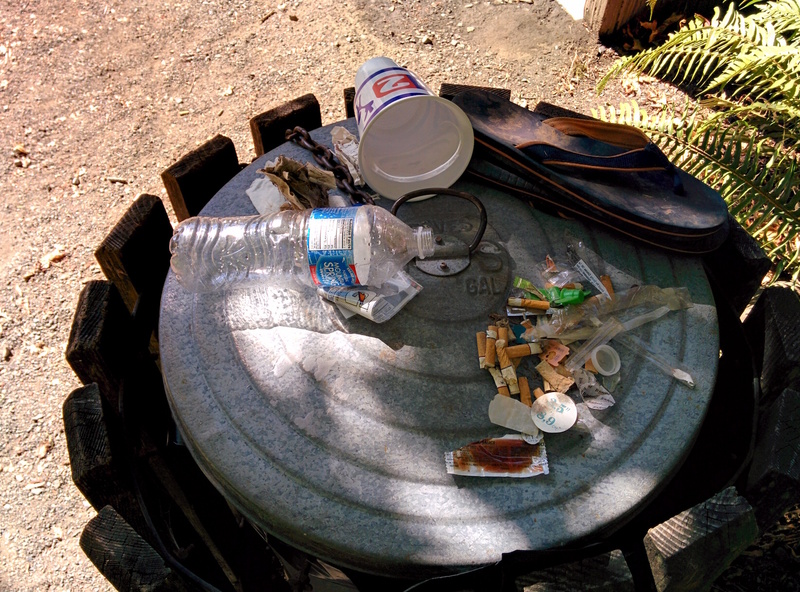 Who goes on a hike smoking and eating crap fast food as they walk and then discards the empties leftovers? Thankfully we don’t know anyone like that and do not want to. When we got back down to the parking area we laid out our trash bounty to take a picture for posterity, so you can see what we all too often find on our travels and to make the point that you can never go wrong carrying a disposable bag with you to clean up after the all-too-common lazy scumbag litterers of the world. After the nasty photo opportunity we carefully tipped the lid and dumped our bounty into the trash can then vigorously rinsed our hands under the faucet to get off the cigarette stench. Good deed done for the day we headed back to our campsite to quickly pack up and head out to our next, unknown, stop. Adventure…Yay!